Great Day at Pioneer Square and it was nice to see new people in the group. This is a view sitting under the pergola looking toward the "Sinking Ship". Fellow sketcher Guido is sitting in the foreground. 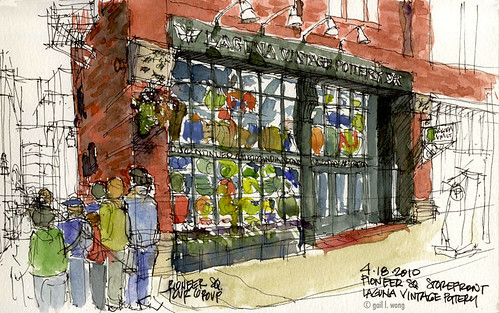 Laguna Vintage Pottery is my favorite storefront in Pioneer Square. The display of the pottery creates a beautiful mosaic of color. 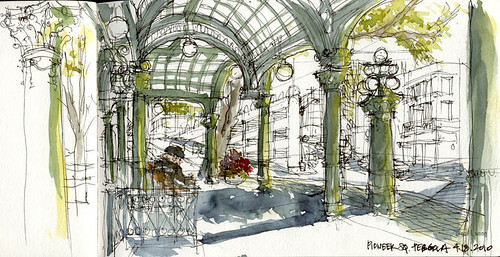 what gorgeous sketches! so clear why the pottery shop is your favorite -- beautiful! These are both perfectly captured, Gail. I like the pottery colors being repeated in the (Underground Tour?) people. And it was great to see the window seat sketch -- also much admired -- in person at the Zeitgeist sharing afterward! Thanks Beth and Susan. It was a good choice to go to Pioneer Square. So much to sketch! I agree with the other comments. You have such a fluid line and a great sense of color.